AutoComplete feature in Internet Explorer provide suggestions while filling text boxes for email address and usernames. 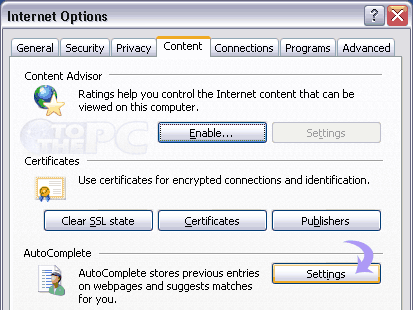 These suggestions are provided as per autocomplete browsing history stored in Internet Explorer. In a multi-user environment, showing autocomplete or autofill suggestions may not be liked by many users and turning it off can be a better option. 1. Launch and Open Internet Explorer. 3. Then click on ‘Content’ tab on Internet Options window. 4. Click ‘settings’ button next to auto complete option. 5. Uncheck all options to completely disable & turn off autocomplete. To delete previously stored AutoComplete history, click ‘delete’ button under general tab. 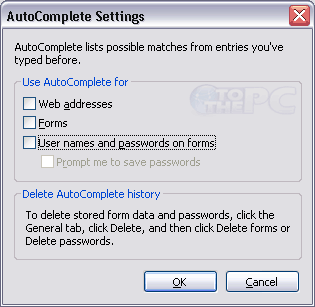 Then click delete for forms and passwords for removal of autofill history. Remove Internet Explorer 8 in Windows7 officially?